Our apartment building is one of the ugliest on the block, but at least the street view is nice! 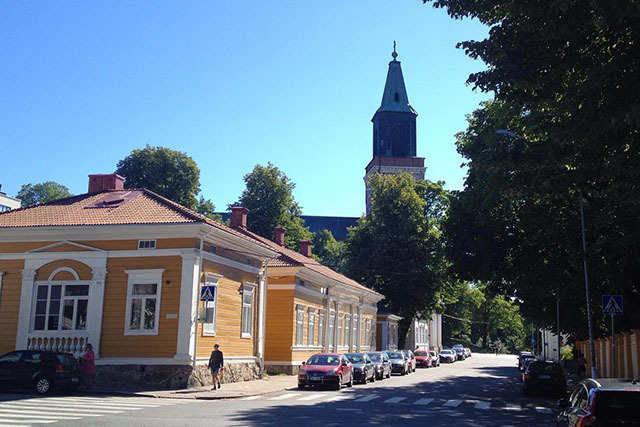 The mustard colored buildings are part of Åbo Academy, the Swedish University and you can see the Turku Cathedral in the background, a super helpful reference point! 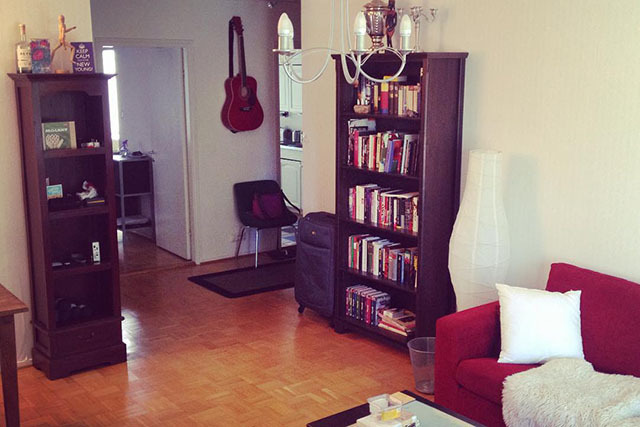 Before I left for Finland one of the most common questions I got was “how did you find a place to live?” Well….we are subletting a one bedroom apartment from a Finnish couple who have gone to Boston to do postdocs and research (funnily enough). They posted their apartment on a university listserv and Tim’s supervisor passed it along to us several months ago. Some people said that they would be wary of finding a place online and not seeing it in person. Really though the couple was really easy to work with and spent a lot of time via email answering our questions about utilities, internet, and other amenities nearby and in the building. Tim needed a place to stay for a month prior than our sublease was available, and he found something completely legit and non-sketchy through a FaceBook group (of all things). I think as a university town, there is a lot of tenant movement which actually helps. There are also a lot of international students and researchers looking for school year accommodation. So far I’ve no complaints about the apartment. The living room is good sized and there is surprisingly a lot of storage space. There good afternoon light (at least in August!) and we are able to leave windows open pretty much all the time. Amenity wise, there is fast (and cheap) wifi, a tv, a small washer in the bathroom, and Euro-sized appliances in the kitchen. Other than buying some organizational closet cubes and a casserole dish at IKEA, I don’t think anything is missing. 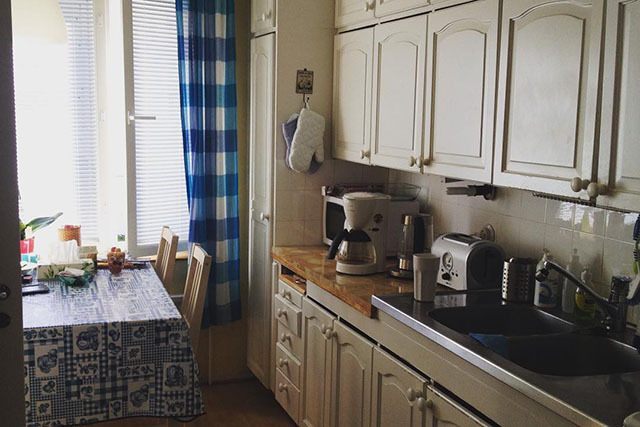 The kitchen is narrow but perfectly manageable, and connects on the left to the bedroom. If I were to bring a few more things, it would have been some basic spices, but they are well stocked on tea! The spices are available easily at the supermarket, but I have to slowly translate as I go. 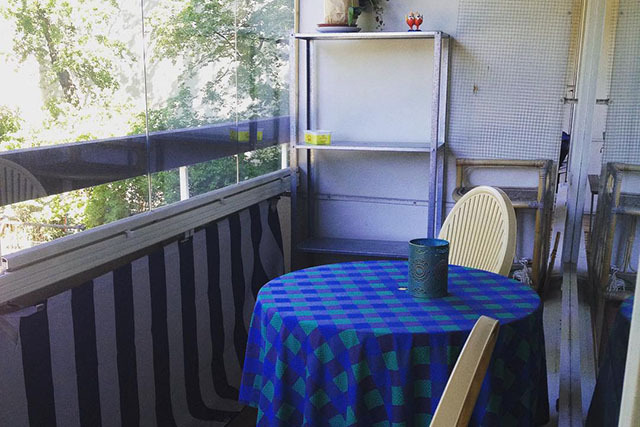 One of the best things about the apartment is the balcony. We didn’t have any outside space in Montreal (after having a massive porch in Bloomington) and I for one was missing some convenient fresh air. The glass panels slide open and out of the way for when the weather is nice. I don’t know how cold it will be out there when the weather turns, but we’ve been having a string of sunny 74F/23C degree days and save for about 1 hour of direct afternoon sun it is just perfect. The view from our balcony at 9 o’clock at night. 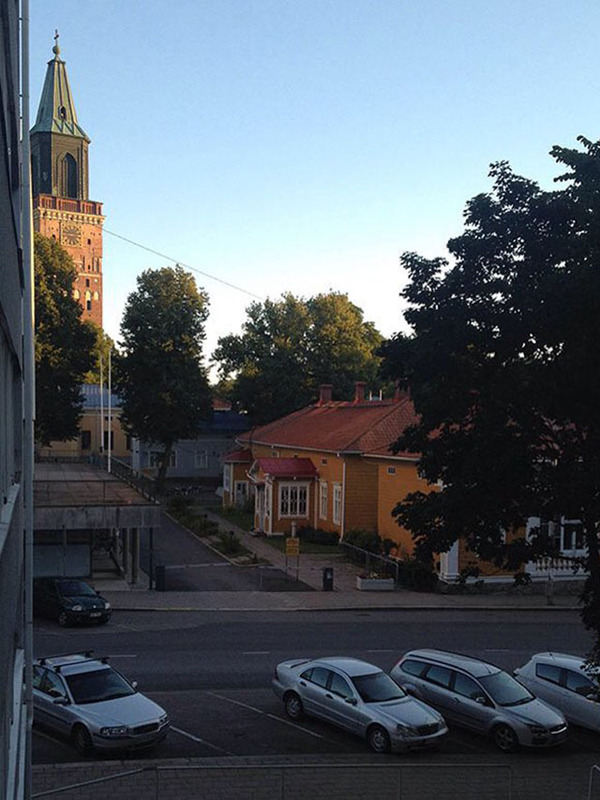 Other than hearing the Turku Cathedral clock chime on the quarter hour, our street is pretty quiet. The location is perfect and it is about a 15 minute walk for Tim to work, and the other way it takes us 10 minutes or so to walk downtown for access to restaurants, bars, and shopping. The main bus terminal is also about 10-15 minutes walk and the river is one block away. And what Turku lacks in parks (especially compared to Montreal), it makes up for in lazy river lounging, a post for another day. Posted in Daily Life, Finland on August 18, 2015 by Sarah.